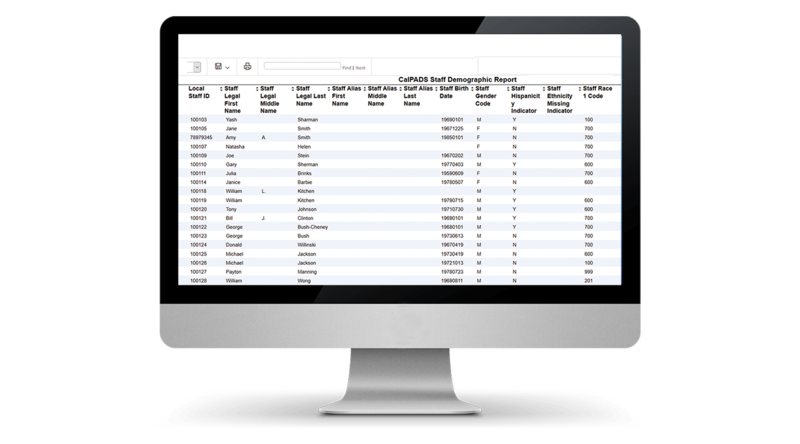 The Core System allows you to track all personnel records in one place. With integration into other systems, Helios can provide the school business office the ability to look in one place for all information about any employee (certificated, classified, volunteer, substitutes, etc.). 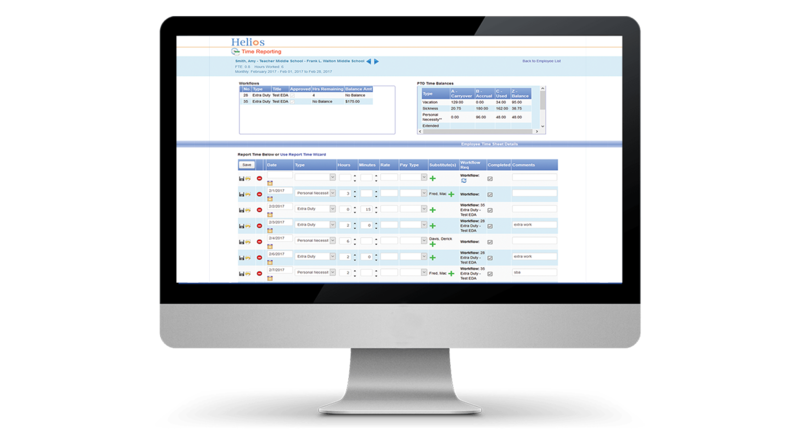 With your data all in one place you can eliminate duplication of data entry and errors, generate reports across various modules for a more holistic view, save your team time, and save your school money. The add-on modules enhance the Core System by furthering the automation of the school business operations. These modules help eliminate manual paper processes, allowing principals, or school site administrators to perform functions normally done by HR or other school operations. Last minute requests for reports or information are made easier and more efficient as these modules feed each other and support the Core System. They are not necessary to use the base modules, they are meant to enhance the system and provide HR and the school business with more efficient cost saving processes. Allows school and district staff as well as employees to report time and attendance. This includes absences (negative attendance) for permanent full time employees as well as time reporting (positive attendance) for hourly employees and substitutes. It generates reports for payroll and finance. It also can accrue and calculate leave balances for employees based on bargaining unit and other rules. Helps new hires to complete forms and enter information online easily. New hires can read and sign district forms and documents, including manuals and policies. The information collected includes personal information, W-4, I-9, dependents, benefits, as well as documents like resumes and transcripts. Eliminate your paper packets and have everything online, allowing new hires to complete onboarding anywhere from a web browser. Helps streamline the personnel requisitions by making them completely electronic. District forms can be set up in Helios and the approval routing can be based on multiple criteria including account codes, funding sources, and employee types. 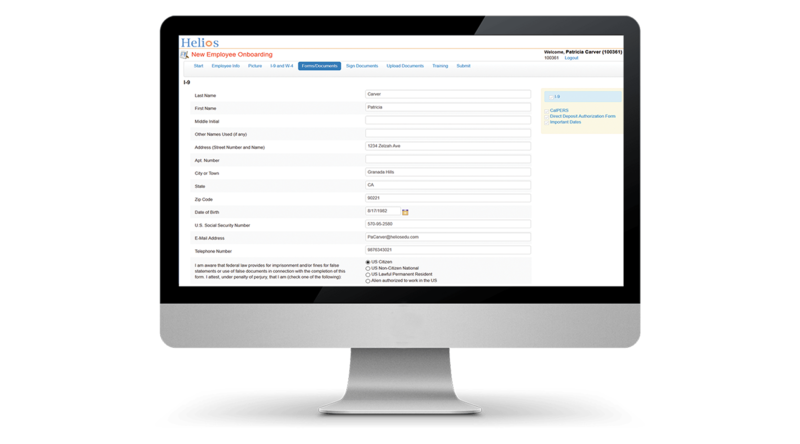 At each step, Helios sends notifications to the approvers to review. All requisitions can be tracked and history and progress can be viewed. At each step, approvers can electronically sign and approve the requisition. After final approval, Helios updates position control and other appropriate areas based on the workflow. The portal provides the means for self-service, enabling employees to access their data on evaluations, credentials, upload documents, check leave balances, and other information. This empowers the employees, and saves HR time in having to answer employee queries and emails. Document management and tracking – helps with uploading or scanning in hard copy documents and attaching to employee profiles. This module is part of the Helios core product. Documents can be shared by employees or with employees. This creates an electronic employee file and provides easy access to documents including contracts, W-4, I-9, test scores, transcripts, resumes, memos, and other forms. 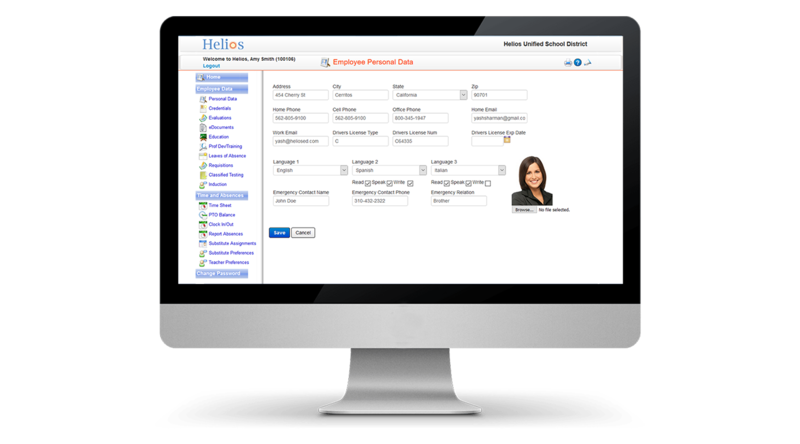 Helios also has eForms – electronic forms that enable employees and new hires to complete and electronically sign forms online without the need to download any software. Admin staff can design these forms within Helios easily using built-in Form Designer. Helps with online evaluations based on district evaluation tools and templates. Allows administrators to complete evaluations online, electronically sign, and submit them. Employees can see evaluations on the Employee Portal and submit comments too. Multiple evaluation forms for different employee types can be built in. It also sends reminders as well as schedules next evaluation based on criteria. Helps compare teacher credentials to courses and classes taught, check for compliance, and flag any potential mis-assignments. This is very useful to check which teachers may be teaching out of compliance. The assignment tracking feature of Helios is dependent on data sources such as teacher class assignments, course codes, and other values. 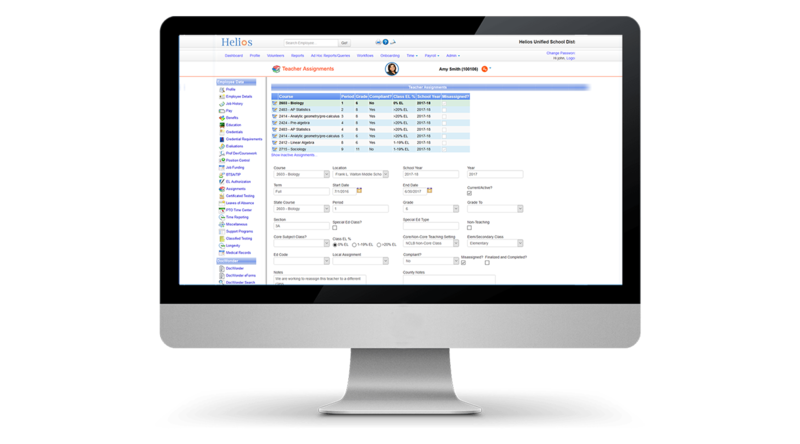 The district may choose to import the assignment data from their student system and Helios can help with this integration. If the district uses the standard CBEDS/CalPADS course codes then that will reduce the setup time. The assignment monitoring feature in Helios also includes assignment monitoring prediction which is not meant as a substitution for a human professional conducting assignment monitoring but is only a very preliminary indicator. 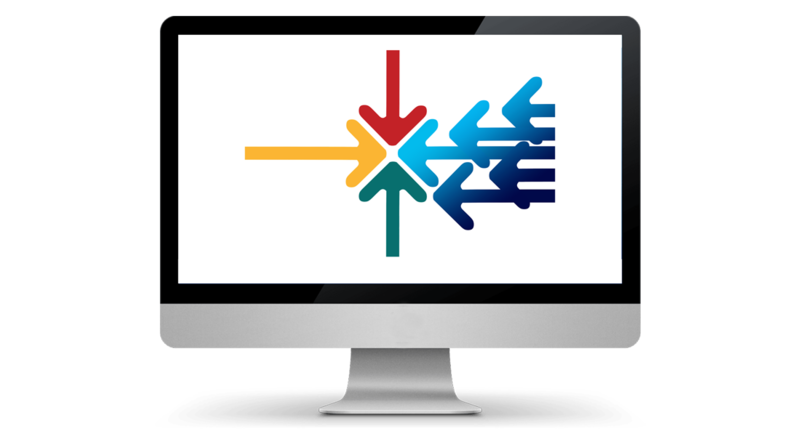 Streamline your recruitment and hiring process. Post jobs, enable applicants to apply online, screen and manage applications, and allow review and scoring of applicants by HR, principals, and hiring managers. You can communicate with applicants online, check references, check credentials, and make final hiring decisions. This module is fully integrated with Helios’ position requisition and new hire onboarding modules to allow for seamless hiring workflow process. Onsite training can be arranged. We can perform a train the trainer session, train principals and other users of the system (if your plans are to disseminate work to school sites), train employee, etc. 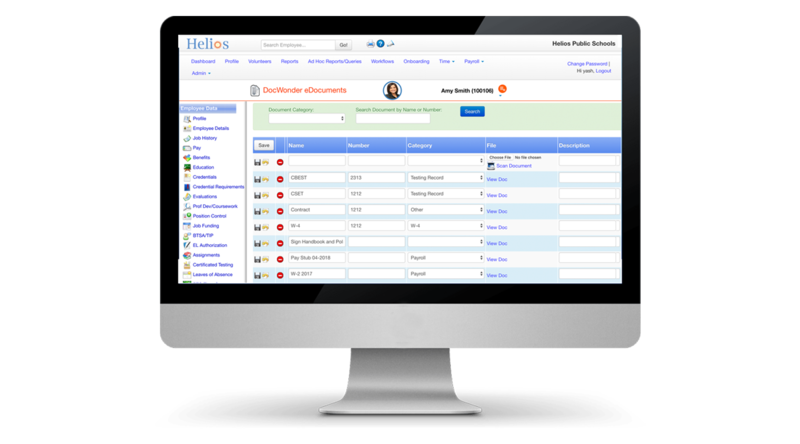 Helios can talk to or integrate with other systems, including student information systems, financial systems, district and county systems, and other systems for data import or export. This integration reduces the multiple data entry, saving time and money, while reducing errors.